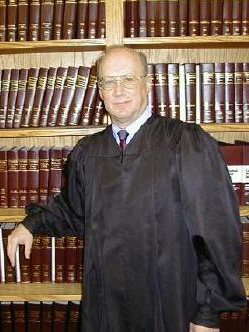 We the People - Hall of Judicial Shame: Honorable Ira Kaufman, Superior Court Judge, State of California, County of Lassen, Appellate Division, President of California Judges Association | Motorists' Rights... Matter! "The California Judges Association is a voluntary association of the judges of the state court system. The organization works with the State Legislature, the Judicial Council and the State Bar to improve the law and represent the interests of judges." An hypocritical advocacy that does advance the SELF interest of Judges and the State Courts, to the clear detriment the Rule of Law and the general welfare of We the People. It would be fantasy to say that Judge Kaufman here was a rare deviant of injustice personified, but sadly it's not the case. Nonetheless, these personal traits did serve him well as he rose in the ranks to become the President of this band of _______; a poster child for a corrupt judicial farm system where the end justifies the means. When a Judge takes the oath of office I can't find the clause that places their self interest above the rule of law, but it must be there in the fine print as a prerequisite to succeed and advance in their profession. Our nation's traffic courts have devolved into a lawless facade, where We the Sheeple are brought forth en mass to be fleeced if you have the means, or to become indentured servants if you don't have the price of admission. A system based on a wholesale disregard for the rule of law, a de facto police state, where you would have a better chance in Moscow or Tehran. It's the officer's job to tag you, the district attorney's job to make sure they maintain the status quo and quash challenges to their criminal enterprise, and the judge is there to extract the money, or to put you on payment plan. One federal site suggest it's important for courts to have the appearance of being fair, conforming to the rule of law. If the judges actually pretended to be fair, those among them that do care might actually start following the rule of law... what a concept. It would be a start. Judge Kaufman came to our attention when he made a convoluted ruling on an appeal, citing his own invented scenario that wasn't even part of the record. Conspicuous here, was the ruling didn't reference or mention a single law cite, or fact, contained in this 30 page plus appeal brief. One of many such like instances brought to our attention this month in California. New court SOP: Ignore the rule of law and never mention it, and it never happened. Even more egregious is how our traffic courts work, an organization of like individuals that the (dis) Honorable Ira Kaufman is the president of. A system where the trier of fact is not permitted to allow constitutional arguments as an affirmative defense - the law need not apply - guilty. A system where the focus is on fine and fee collection and the court has a financial interest in convictions, not justice. Then imagine a systems where the judge has constructive knowledge they are operating outside the law and they continue to convict en mass. This is not law, it is now an institutionalized criminal enterprise. A system our founding fathers had in mind and tried to protect us from, when they drafted the U.S. Constitution and placed 'We the People' superior to the nature of power and greed of those that wield it. This is a universal national problem that we have yet to find an exception to. Carson City, Nevada: during a side bar, prosecutor says to judge, what he is arguing here doesn't matter because he probably doesn't have the ability to appeal. Florida: Not guilty, but ordered to pay all fines and court fees, as court cost. New Hampshire: Defendant appeals, but license is suspended pending outcome. Nevada Deputy AG: My job is to protect the interest of the state, not the people. Mina, Nevada: Counselor, we were not going to question the validity of the radar guns in this court, because they are mine and I bought them for the Sheriff's department to use. USDOT Speed Limit Workshop: Texas Judge who was the guest speaker makes joke about motorists coming to court claiming no study was done, then laughed, that may be so but there is no standard in Texas law to be met either - guilty. Douglas County, Nevada: Local newspaper story, Judge calls the state patrol complaining of the reduction in the number of citations issued in his district, asked local Sheriff to help get numbers up. The Sheriff happily assigned reserve deputies to help the judge out of his budget problem. Pennsylvania: It's illegal to cross examine the validity of the charges (posted limit) if its a speed case. How is justice possible when the courts are wholly funded by the fines and fees they collect or if the citations stopped their court would have no reason to exist. It's 'We the People' and our courts are there to enforce our rights, not it's own self interest. We need to demand a system based on the rule of law and accept nothing less. Our rights matter and our Constitution is on our side so we have the means to fight! ...that we here highly resolve that these dead shall not have died in vain. . . that this nation, under God, shall have a new birth of freedom. . . and that government of the people. . .by the people. . .for the people. . . shall not perish from the earth.